With all the free games given away in recent months, I dare say you could’ve assembled an entire PC gaming backlog for free at this point. Enter GOG.com with another game (or two!) to throw on the pile: Stronghold HD. In case you missed it way back in 2001, Stronghold blends the builder and real-time strategy genres. 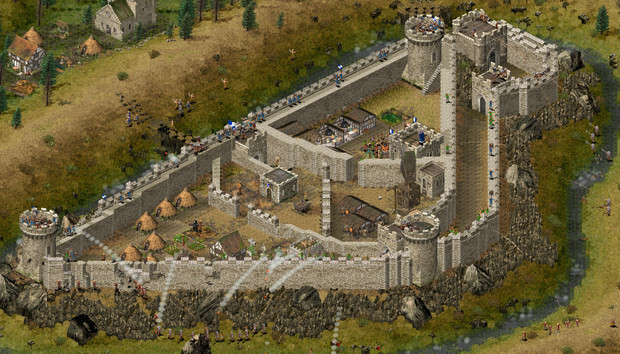 Taking place in Medieval Europe, you need to design and build out your own castle, then fill it with troops and send them off to your enemy’s (probably much more historically accurate) castle. It’s a classic, and well worth picking up even nowadays. One caveat: The Steam version has some issues with Windows 10. I’m not sure if those have been fixed for the GOG.com version, but if not it’s simply a matter of activating Legacy Mode. Whew. You can also check out this YouTube video Rock Paper Shotgun dug up if you want an idea of the horrors you’re in store for. Pretty sure Stronghold HD is the consolation prize for owning a copy of A.D. 2044, and also that we’re all on a list now. The giveaway is set to expire at 3 a.m. Pacific Time on October 26 (a.k.a. tonight) so be sure to jump on it if you want that free copy of Stronghold HD. Or don’t, if you can’t stomach owning A.D. 2044. That’s understandable too.